This past week my friend Ian Lourens and I headed for the Witte River, high up above the “Bainskloof pass”. It is a far flung spot given to vagaries of weather and wind that are frequently at odds with conditions in close by but different areas, predictions of what to expect are fraught with danger. 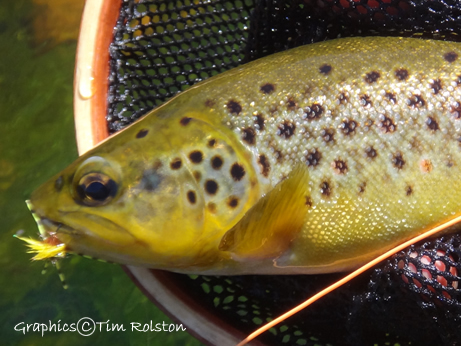 The stream is notoriously tricky with some gorgeous brown trout, although not many, low numbers of fish contributing considerably to the possibility of getting skunked. In short it is a troublesome stream to fish and arduous to boot. Access can be gained either by a long hike along a jeep track or a short cut straight up the side of the mountain which swops effort for time. You get there faster but more beaten up, particularly as the short cut route doesn’t have a path and one has to bash through brush and deadfall to reach the trail higher up. I hadn’t fished so far for the season, the rivers had only just opened a week and a half previously and even then, although officially in the frame, they had been actually too high to fish for much of that time. So I was not well prepared to start with, there is the extremely arduous hike up the mountain to deal with and further walking still to reach the water. It is not too far from an epic adventure and fraught with risk of failure if indeed not personal injury. I slept little the night before, I had troublesome thoughts that something would go wrong and as a consequence I checked and rechecked my gear, boots, rods, leader and fly boxes, and then stopped the car on the way there to double check. All was fine and Ian and I met up, switched to one vehicle and headed off, we parked on a remote pass and headed straight up hill, our gear safely stowed in our rucksacks for deployment when we got to the water. (It is a good idea on such ventures to carry one’s fishing kit and change near to the stream, affording one the option of dry clothes, socks and boots for the hike out). All went well, the hill seemed inordinately steep, but then neither of us was fit after a three month layoff, and anyway the hill really is steep. At the top we joined the path, level ground pretty much and started to tramp along, joy in our hearts, pleasant thoughts of fish and dry flies filling our minds, and then disaster. I had an eyelash sticking into my left eye and without a thought I brushed it aside, something I have done hundreds of times before. This time, the movement knocked my left contact lens out of my eye and into the bush. It was a most depressing moment, after wearing contact lenses for over thirty years without mishap; here I was on the top of a mountain, brown trout within reach and one eye out of action. We searched of course, wasting a good half an hour or more on our hands and knees in the vain hope that we might be fortunate, but to no avail, and eventually I thought back to an exercise with a sports psychologist when part of the National Fly Fishing Team. Without going into too much detail we had been instructed to “fish” with completely mismatched tackle and after some fumbling we all discovered that we could prevail. The lesson was that if you are truly good at something you can manage, “make a plan” as it were. Not perhaps perform at one’s peak but at least make do, it was a lesson well learned. Anyway I figured that I should just have to make the most of a bad situation and anyway in the worst case scenario I could provide guiding support to Ian, who was still in possession of all his faculties. So we carried on along the path, rigged up gear, changed clothing and boots and headed for the water. The oddest thing, I was actually quite capable of casting with reasonable accuracy, although should a branch be in the way it was tricky for me to judge exactly where it was. But I could cast and fish and that was a plus. Spotting fish was a little more troublesome, one doesn’t realise how much one relies on binocular vision when looking “through” the water, so that was an issue, but the most difficult, in fact the positively dangerous aspect was the inability to walk and to wade. Depth perception is everything when walking over broken ground, either under the water or not, and my ability to “rock hop” was severely hampered. After some hiking, wading and falling, (mostly falling), which included a dreadful tumble that ripped off a substantial piece of my thumbnail we actually spotted a fish. I was quite surprised that I could see it at all, but he was there and Ian and I spotted it at the same time. I really wasn’t feeling too confident and Ian was in pole position so he made the cast for the trout. 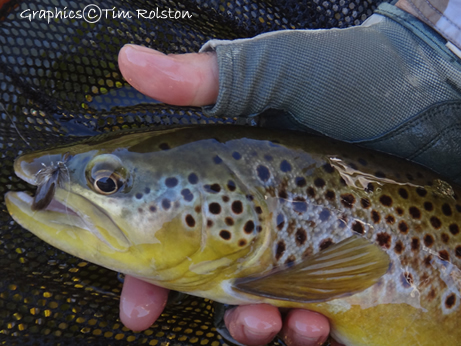 The fish moved slowly (as only browns can), inhaled the fly and it was game on, a brownie close to 18 inches in the net. Darn we had some success, despite all the troubles and the memories of that psychologist came flooding back again, “you can do it”, “It doesn’t need to be perfect”.. Feeling somewhat buoyed with confidence I took the next run and got a slightly smaller female brown that ran straight into the bushes, depth perception had me thinking that she had some way to go to reach the bank and equally prevented a chase. Ian was dispatched to dig her out of the twigs and our second fish was landed. 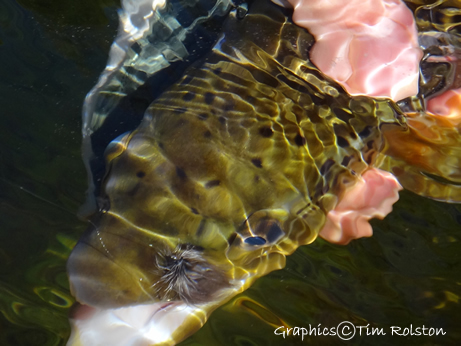 Actually during the course of the day I didn’t fish well, it is tricky to spot fish or time the strike with one eye. Ian faired a tad better as one might expect. It wasn’t the best opening of the season I have ever had and the hiking was dreadful, it is simply the most trying experience attempting to walk on broken ground without the use of both eyes and the walking and wading caused me a lot more trouble than the fishing, even though that wasn’t perfect. In the end there were two thoughts that were predominant despite having a body that felt as though it had just lost an argument with a Sherman Tank. You can prevail when things aren’t going right, the wrong line, forgot your favourite fly box etc, don’t quit because you know how to fish so just fish. The second, more troublesome consideration, having spent the day in two dimensional purgatory, is what would happen to your fishing if you were permanently limited in such a manner? It really brought home the fact that you should absolutely not fish without eye protection, this was a temporary setback and on arriving home I was able to restore my vision with a spare lens. A hook in the eyeball could mean that every fishing trip thereafter would be like this one, something I don’t wish to contemplate. Last year I got as close as I ever have to sticking a hook into my eye, a wayward cast combined with an unexpected gust of wind had me dangerously close to being renamed “Cyclops”, it doesn’t bear thinking about. This entry was posted on September 15, 2012 at 12:21 pm and is filed under Cape Streams, Fishing, Uncategorized. You can follow any responses to this entry through the RSS 2.0 feed. You can leave a response, or trackback from your own site.